Manufacturers of rubber washers and rubber seals. 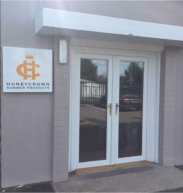 Honeycrown Rubber Products Ltd is a UK based company which has been producing high-quality lathe cut rubber washers, gas pressure washers, and rubber seals to customer specification throughout the UK and the world since it was established in 1982. We have over 40 years of experience in the manufacture and supply of these products, the company has an enviable reputation for delivery, price and quality of all its products. 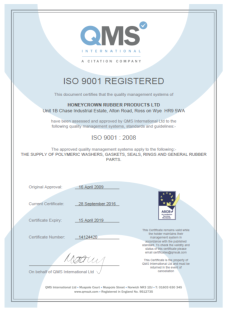 The attainment of BS EN ISO 9001:2008 quality management systems and BS EN ISO 14001:2004 environmental management systems accreditations provide independent proof that our system works, giving you, the customer peace of mind when ordering from the UK’s leading washer manufacturer and supplier. You can rest assured that Honeycrown Rubber Products Ltd has the ability and expertise to fulfil your requirements, whether you are looking for gas pressure washers, rubber washers or rubbers seals, you will receive a first class service.